Ten-man Glenavon emerged on top in a feisty NI Hospice Charity Shield showdown with Crusaders. Teenage striker Jordan Jenkins was the hero, the 16-year-old scoring the only goal of the game 12 minutes from time to seal a 1-0 win for the Lurgan Blues at Mourneview Park. The Irish Cup winners had Mark Patton sent off in the first half for a last-ditch foul on Gavin Whyte, while the Crues lost captain Colin Coates and midfielders Michael Carvill and Matthew Snoddy through injury – giving the league champions cause for concern ahead of next week’s Premiership kick-off. There were no goals in the opening half but there was certainly a competitive edge to the pre-season fixture. Greg Moorhouse flicked a header over the bar in the 17th minute for Glenavon, while at the other end Gavin Whyte cut inside from the right before sending a low drive into the arms of Jonny Tuffey. 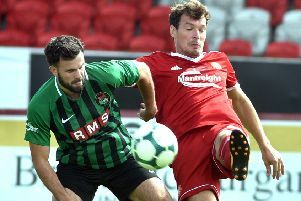 The Crues lost skipper Colin Coates in the 23rd minute through injury, and then the Lurgan Blues were reduced to 10 men with Patton’s dismissal. Jordan Owens sent Whyte through on goal, and Patton flicked a boot out to bring the winger down on the edge of the box to earn a straight red card from referee Keith Kennedy. Crusaders were forced into their second substitution in the 31st minute when Michael Carvill sustained a nasty head injury after being on the receiving end of a Kris Lindsay clearance. A groggy Carvill was helped off with blood streaming down his face, to be replaced by David Cushley. Glenavon also made their first change of the day with Moorhouse being replaced by Declan O’Brien. The Lurgan Blues almost claimed the lead in the last minute of the half but O’Brien’s shot was well saved by O’Neill. Glenavon introduced Andrew Doyle and David Elebert at the half-time interval, and Doyle was straight into action to deny Lowry with a last-ditch tackle in the 49th minute. The Lurgan Blues went close in the 53rd minute when O’Brien was afforded space inside the box, but the striker’s shot was well saved by O’Neill at the near post. Jordan Forsythe went close with a header from Cushley’s cross in the 60th minute, and when the ball was cleared to Billy Joe Burns the defender fired in another effort that was held by Tuffey. Tempers flared in the 64th minute when Crues winger Whyte and Glenavon substitute Doyle clashed, but it ended in an amicable hug following some stern words from referee Kennedy. Crusaders midfielder Snoddy was stretchered off in the 72nd minute following a crunching tackle from Doyle. The deadlock was broken in the 78th minute with Jenkins delivering the decisive blow. Michael Gault fouled Guy Bates on the edge of the box to give away the free-kick. From the set-piece Gary Hamilton’s low shot squirmed across the box and wasn’t dealt with by the Crues defence, and Jenkins pounced to fire home from seven yards. Crues substitute Marcio Soares forced Tuffey into a decent save in the 83rd minute as the Premiership champions looked to respond. Tuffey did well again to deny Cushley in the 85th minute, this time palming Cushley’s 35-yard free-kick around the post. GLENAVON: Tuffey, Kelly (Elebert 46), Lindsay (Doyle 46), Kilmartin, Marshall, Cooper, Patton, McGrory, Moorhouse (O’Brien 33, Jenkins 70), McCourt (Hamilton 61), Bates. CRUSADERS: O’Neill, Burns, Beverland, Coates (Gault 23), McClean, Lowry, Clarke (Snoddy 55, Soares 72)), Whyte (Holden 68), Carvill (Cushley 33), Forsythe, Owens. Subs not used: Lyttle, Heatley.